If you’re interested in outdoor and landscape lighting in Dallas-Fort Worth, TX, then MDM Landscapes is here for you! We are experienced and professional, and will gladly install your outdoor lighting efficiently and with care. Please give us a call today at 817-396-0125. 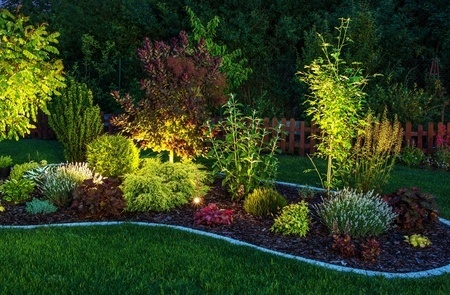 Installing outdoor or landscape lighting can be a great addition for lawn care as it offers more beauty, safety, and curb appeal. When you need outdoor and landscape lighting in Dallas-Fort Worth, TX, its important to consider these things. Decide what you want to light. Select the appropriate lighting techniques. Select the appropriate lighting fixtures and accessories. Choose the power supply, either line or (more commonly) low voltage. Fortunately, our specialists will be able to help you make decisions based on our knowledge and experience. A low voltage lighting system operates on a 12-volt system, which requires a transformer to function. There are multiple advantages over a 120-volt system for smaller properties. These systems are energy efficient and can offer more light output, and the risk of electric shock is minimal. Outdoor lighting and landscape lighting for your Dallas-Fort Worth, TX commercial property, apartment complex, or residential development can help extend the usable hours of a given space, and can drastically alter the mood of an environment. There are many different types of lighting systems available, using different kinds of light bulbs from LEDs to CFL bulbs and traditional incandescent lights. Some lights will be used more for effect, while others will be meant to cast as many lumens as possible. Typically, the brighter the light is the more expensive it is to operate, as the energy uses are greater. Solar lighting systems are excellent outdoor and landscape lighting for your DFW property, as they conserve on energy usage, but still, want the ample lighting at night afforded by hard-wired lighting systems. Solar lights are, of course, dependent upon their exposure to the sun, and so placing them in shady areas won’t yield satisfactory lighting at night. Care must be taken when mounting lighting systems to avoid damaging plants or disturbing their photoperiod, as many plants depend on a certain period of darkness to bloom. 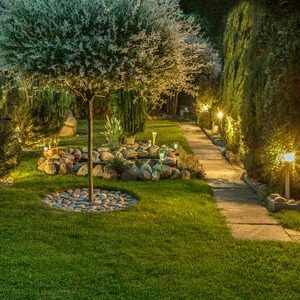 We will employ a variety of mounting techniques to ensure your space is properly lighted without harming elements of your landscape. Artisan lights can create interesting effects and drastically enhance an environment’s personality. They are great for illuminating walkways or seating areas without glaring in your eyes. Spotlights are great for emphasizing certain elements of your landscape and can highlight the focal point you want to showcase. If you’re interested in outdoor and landscape lighting in Dallas-Fort Worth, TX, please call us today at 817-396-0125. MDM Landscapes will perform other landscaping services to create the environment you want! Updated on March 27, 2019 at 2:34 pm by MDM Landscapes.